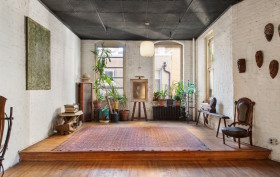 This raw-edged, sprawling 3,250 square-foot loft at 34 West 13th Street, on a bustling yet somehow old-school Greenwich Village street is on the market for the first time since the building became a cooperative in the 1970s. Formerly an acting school–there are two stages built in, which could be kind of cool if you’re the theatrical type–the space is currently configured as a two bedroom with a laundry room, a big open kitchen/dining room, a living area and a hall gallery. Located between Fifth and Sixth Avenues, it’s above the Quad Cinema indie theater (set to reopen with a big renovation this fall), which is also great if you love the movies. The ask is $5.25 million, and there are several suggested floor plans (see the photo gallery ahead), should you want to create a three- or four-bedroom home.